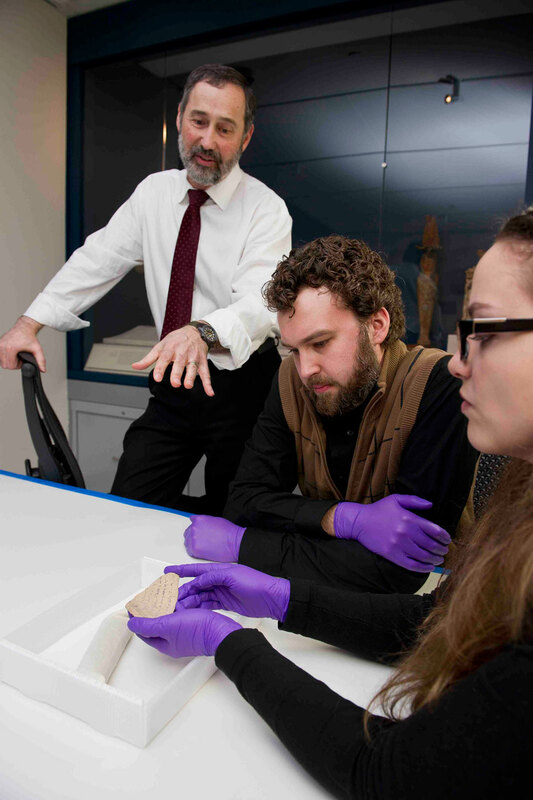 The museum brings together students and faculty in an environment that encourages collaborative learning through the close examination of artifacts from the ancient world. Since the museum opened in its current location in Gilman Hall in December 2010, numerous courses have been taught in the space, with faculty, graduate students and undergraduates engaging in productive dialogue as they study original ancient artifacts. Students are also actively researching artifacts and producing online catalogues and printed and online materials for the museum and its visitors. Since the museum opened in the Fall of 2010, over 120 courses have either met at the museum or worked directed with the museum collection. Here is a listing of recent JHU courses and their instructors—in departments and programs including Art, The Undergraduate Program in Archaeology, Near Eastern Studies, Classics, History of Art, History of Medicine, Expository Writing, Materials Science and Engineering, and the Museums and Society Program—who worked with or visited the museum, or are currently doing so. Ancient American Metallurgy. L. Deleonardis (History of Art). Undergraduate course. The Archaeology of Ancient Cyprus: Investigating a Mediterranean Island World in the JHU Museum. E. Anderson (Classics). Undergraduate course. Babylon: Myth and Reality. M. Feldman (History of Art/Near Eastern Studies). Undergraduate course. Ceramic Analysis in Archaeology. J. Osborne (Near Eastern Studies). Undergraduate course. The Disappearing Wall. S. O’Connell (Classics). Undergraduate course. Examining Archaeological Objects. S. Balachandran (Near Eastern Studies). Undergraduate course. Expository Writing: Roman Gladiators. E. Campbell (Classics). Undergraduate course. Intermediate Ancient Greek. D. Dooley (Classics). Undergraduate course. Johns Hopkins: The Idea of University. B. Leslie (History of Science). Undergraduate course. Library/Laboratory. G. Dean (History). Undergraduate course. Location Photography. H. Ehrenfeld (Homewood Art Workshops). Undergraduate course. On Diet. Are We What We Eat? A. Rebrovik (Political Science). Undergraduate. Problems in Ancient American Art. L. Deleonardis (History of Art). Undergraduate course. Religion in Roman Art. PL Tucci (History of Art). Graduate course. Still Life/Interior/Landscape. C. Hankin (Homewood Art Workshops). Undergraduate course. Worshipped Goddesses, Worshipping Women: Femininity, Religion and Mythology in Ancient Greece. S. Stern (Classics). Undergraduate course. Art and Architecture of Early Christian and Medieval North Africa. N. Dennis (History of Art). Undergraduate course. Art of the Ancient Americas. L. Deleonardis (History of Art). Undergraduate course. Attic Hero Cults. A. Shapiro (Classics). Graduate seminar. Big: Monumental Buildings and Sculpture in Antiquity and today: J. Osborne (Near Eastern Studies). Freshman seminar. Elementary Latin: J. Lamont (Classics). Undergraduate course. Examining Archaeological Objects: S. Balachandran (Near Eastern Studies). Undergraduate seminar. From Feast to Famine in the Ancient World: A. Maskevich (Near Eastern Studies). Undergraduate course. History of Africa to 1880: P. Larson (History). Undergraduate course. Introduction to Archaeology: G. Schwartz (Near Eastern Studies). Undergraduate course. Introduction to the History of European Art. F. Pereda (History of Art). Undergraduate course. Introduction to Middle Egyptian. K. Davis (Near Eastern Studies). Graduate course. Location Photography: H. Ehrenfeld (Art). Undergraduate course. Materials Characterization: P. McGuiggan (Materials Science and Engineering). Undergraduate course. Palaces, Temples and Tombs in Mesopotamia. M. Feldman (History of Art/Near Eastern Studies). Undergraduate course. Power and Politics in Near Eastern Art. M. Feldman (History of Art/Near Eastern Studies). Undergraduate course. Proseminar in Classical Philology: D. Yatromanolakis. (Classics). Graduate course. Ritual and Magic in Ancient Egypt: M. Fraser (Near Eastern Studies). Undergraduate course. Rome as Told by its Narrators: A Journey through History, Literature, Arts and Film. T. Katinis (Department of German and Romance Languages). Undergraduate course. The Active Body: On Display and in performance: R. Brown (History of Art). Graduate course. The Archaeology of Death, Burial and The Human Skeleton. C. Brinker (Near Eastern Studies). Undergraduate course. The Stone and the Thread. De Leonardis (History of Art). Undergraduate course. Discover Hopkins Health Studies: The Hospital: A. Puglionesi (History of Medicine). Course for high school students. Ancient Greek Civilization: Society, Archaeology, Literature, Philosophy: D. Yatromanolakis (Classics). Undergraduate course. Curating the Roman House: H. Valladares (Classics) and M. Nichols (W­alters Art Museum). Graduate course. Diplomacy and Conflict in the Ancient Middle East: J. Lauinger (Near Eastern Studies). Undergraduate course. Drawing: The Portrait: C. Hankin (Art). Undergraduate course. Island Archaeology: The Social Worlds of Crete, Cyprus and the Cyclades: E. Anderson (Classics). Undergraduate course. Elementary Latin: D. Houston (Classics). Undergraduate course. Native American Art: L. Deleonardis (History of Art). Undergraduate course. Pilgrimage: Art and Anthropology. M. Merback (History of Art). Graduate course. The Archaeology of Death, Burial and the Human Skeleton: C. Brinker (Near Eastern Studies). Undergraduate course. The World of Pompeii: H. Valladares (Classics). Undergraduate course. Tombs for the Living: L. Deleonardis (History of Art). Undergraduate course. : H. Parker (Near Eastern Studies). Undergraduate course. Ancient Near Eastern Civilizations: G. Schwartz (Near Eastern Studies). Undergraduate course. Archaeology at the Crossroads: The Ancient Eastern Mediterranean through Objects in the JHU Museum: E. Anderson (Classics). Freshman seminar. Archaeology, Politics and the Uses of the Past: A. Maskevich (Near Eastern Studies). Undergraduate course. Art and Architecture of the Medieval Mediterranean World: C. Lakey (History of Art). Undergraduate course. Art of the Ancient Andes: L. Deleonardis (History of Art). Undergraduate course. Craft and Craftspersons of the Ancient World: Status, Creativity and Tradition. E. Anderson. (Classics). Upper level undergraduate course. Global Perspectives on the Museum: E. Rodini (History of Art/Museums and Society) and S. Balachandran (Near Eastern Studies). Undergraduate course. Hidden Histories of Museum Objects: S. Balachandran (Near Eastern Studies). Odyssey course. History of Medicine: M. Fissell (History of Science and Medicine). Undergraduate course. Intermediate Ancient Latin: E. Schwinge (Classics). Undergraduate course. Introduction to Archaeology: S. McCarter (Near Eastern Studies). Undergraduate course. Made for the Gods: Votive Egyptian Objects in the Archaeological Museum: B. Bryan (Near Eastern Studies, Museums and Society). Undergraduate Course. Proseminar in Classical Archaeology: P.L. Tucci. (History of Art). Graduate course. Sculpture and the Embodied Viewer: C. Lakey. (History of Art). Undergraduate course. The Roman Republic: History, Culture and Afterlife: M. Roller (Classics). Undergraduate course. What is Philology? J. Neefs, E. Trowick (German and Romance Languages and Literatures). Graduate course. Ancient Israel: In their Own Words: H. Parker (Near Eastern Studies). Undergraduate course. Analysis of Objects from the Eton College Myers Collection: B. Bryan (Near Eastern Studies). Graduate seminar. Ancient Americas Metallurgy: L. Deleonardis (History of Art). Undergraduate course. Colored Marbles in Antiquity: P.Tucci (History of Art). Undergraduate independent study. Expository Writing: Politics, Archaeology, and the Uses of the Past: A. Maskevich (Near Eastern Studies). Undergraduate course. Gender and Sexuality in Early Greece and the Eastern Mediterranean: E. Anderson (Classics). Undergraduate course. Intermediate Middle Egyptian: A. Arico and M. Fraser (Near Eastern Studies). Undergraduate course. Myth in Classical Art: A. Shapiro (Classics). Undergraduate course. Roman Sculpture: P. Tucci (History of Art). Undergraduate course. Survey of Ancient American Art: L. Deleonardis (History of Art). Undergraduate course. Victory and Defeat in Ancient Rome: E. Schwinge (Classics). Undergraduate course. 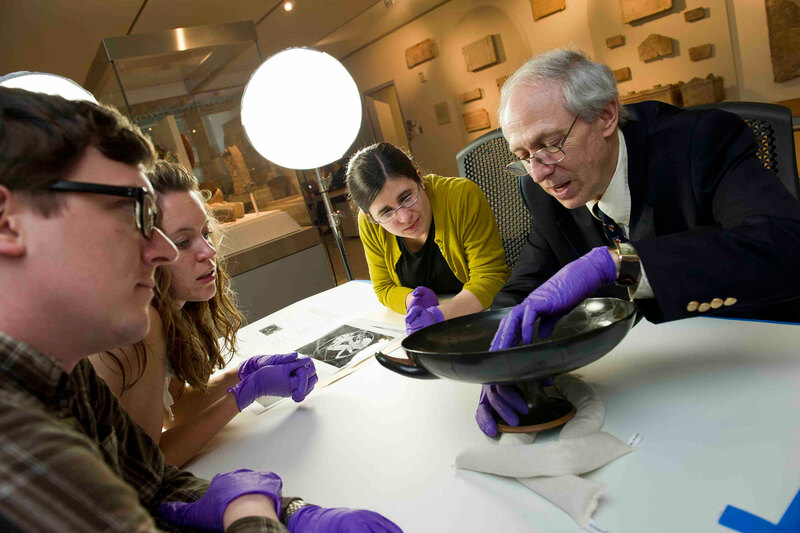 Professor Theodore Lewis (Near Eastern Studies) teaches Advanced Aramaic with an incantation bowl fragment in the museum collection. Ancient Egyptian Civilization: B. Bryan (Near Eastern Studies). Undergraduate course. Archaeology at the Crossroads: E. Anderson (Classics). Freshman seminar. Art of the Ancient Americas: L. Deleonardis (History of Art). Undergraduate course. Critical Issues in Art Conservation: S. Balachandran (Near Eastern Studies). Undergraduate course. Elementary Latin: E. Schwinge and D. Piana (Classics). Undergraduate course. Faience Amulets from the Eton College Collection: B. Bryan (Near Eastern Studies). Graduate course. History of Roman Art and Architecture: P. Tucci (Classics). Undergraduate course. Proseminar in Classical Philology: M. Roller (Classics). Graduate course. The Grandeur that was Rome: E. Schwinge (Classics). High school and undergraduate course. Advanced Aramaic: T. Lewis (Near Eastern Studies). Graduate course. Click here for research completed in this course. Archaeology: Discovering Our Past: S. McCarter (Near Eastern Studies). Odyssey Course. Archaeology of Daily Life: H. Valladares (Classics). Undergraduate course. Students collaborated on an online catalogue, featuring their research. Art and Religion in the Roman World: P. L. Tucci (Classics). Undergraduate course. Elementary Latin: L. Garofolo and D. Dooley (Classics). Undergraduate course. Emergence of Civilizations: G. Schwartz (Near Eastern Studies). Undergraduate course. Greek Vases in the Johns Hopkins Archaeological Museum: A. Shapiro (Classics). Graduate seminar. The course generated detailed labels to accompany the museum’s installation of Greek vessels. Click here for these labels. Introduction to Museum practice: S. Balachandran (Near Eastern Studies). Undergraduate course. Introduction to the Museum: Issues and Ideas: E. Rodini (History of Art & Program in Museums and Society). Undergraduate course. Roman Civilization: M. Sullivan (Classics). Undergraduate course. Museum Study of Objects from the Eton College Myers Collection: B. Bryan (Near Eastern Studies). Undergraduate seminar. 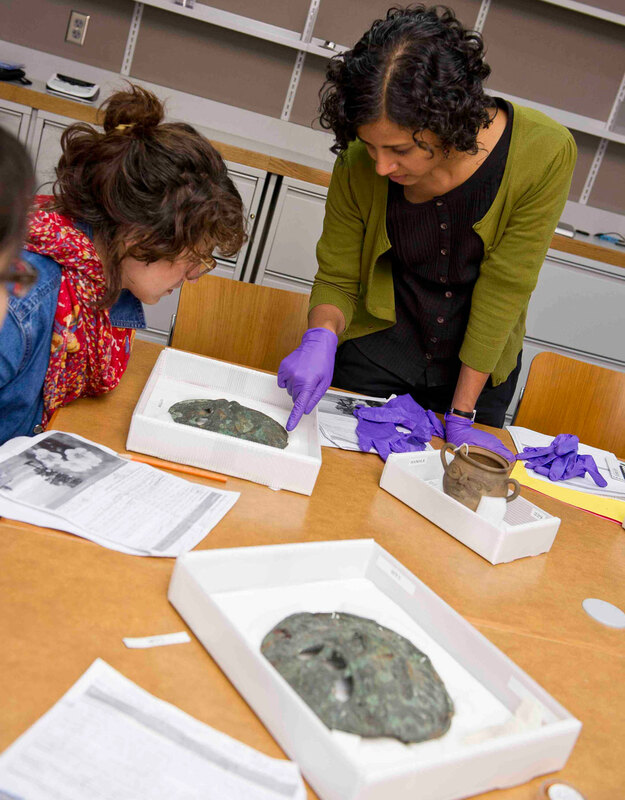 In this class, students were introduced to studying Egyptian objects through an investigation of some pieces from the Eton College Myers Collection currently on long term loan to the University. Cataloguing and research of these objects was part of the course.